In many ways, Bio Force Ape's discovery marks the end of an era. Over the last decade, a number of previously unreleased video games surfaced as playable prototypes. California Raisins, Time Diver Eon Man, and Star Fox 2 only existed as blurry screenshots in ancient gaming magazines until relatively recently. Landmark discoveries like Sunsoft's Sunman and an adaptation of the board game HeroQuest brought to light projects that were never known to be in development, much less completed. Bio Force Ape is different, though. Already a freakish oddity based on what little information was teased in Nintendo Power in the early '90s, the game's notoriety grew exponentially in the years since, resulting in fan games, rampant speculation, and perhaps the greatest prank ever played on the game collecting community. 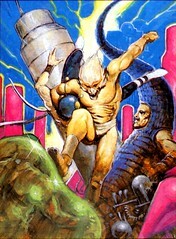 Many simply assumed that a playable version of Bio Force Ape never existed. They were wrong. This is Bio Force Ape -- the genuine article -- in all its naked simian glory. Bio Force Ape was first revealed to the North American gaming press at the Consumer Electronics Show in June of 1991. 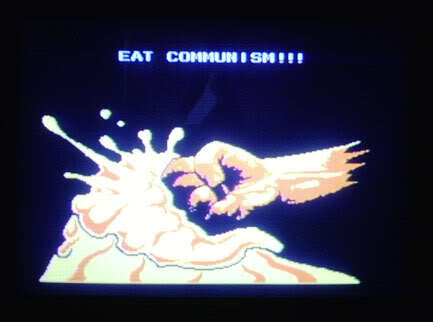 Many NES owners first became acquainted with the title in August, when it was featured in a brief Nintendo Power preview. Promising that a release was "just around the corner," Nintendo detailed a game starring a mild-mannered chimpanzee who suddenly found himself in possession of superprimate strength. Being a fan of professional wrestling, the "practically indestructible" ape took out foes using suplexes and piledrivers. After hyping the already ridiculous premise in subsequent previews with claims that the game featured outstanding graphics and some of the fastest scrolling on the NES, Nintendo Power casually announced Bio Force Ape's cancellation in April, 1992. These small blurbs near the back of the magazine would be easy to write off as a running gag, but the screenshots that accompanied them were too detailed to be a joke. 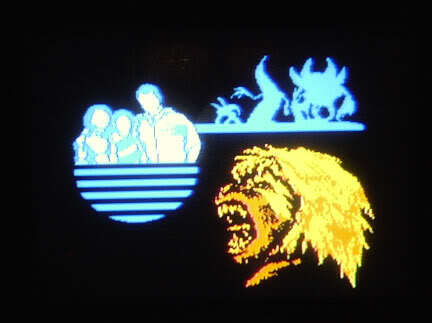 Even with the trademark blurriness and washed-out colors of print magazine screenshots in the early '90s, they were just convincing enough to make one believe -- or at least want to believe -- that an NES game starring a superpowered wrestling ape was out there, somewhere. Years later, Bio Force Ape would be discussed endlessly on NES fansites and message boards. NES enthusiasts speculated on the game's existence, speaking of it in the same breath as other legendary unreleased efforts like Drac's Night Out and Bashi Bazook: Morphoid Masher. One by one, these games were eventually found. California Raisins was discovered at a used game retailer. An English-language version of EarthBound's NES predecessor emerged in a gaming newsgroup. Even a relative obscurity like Secret Ties was found to be entirely complete and ready for release prior to its cancellation. Still, Bio Force Ape remained elusive. No copies were ever discovered by collectors. Little new information came to light. And while devoted gaming enthusiasts had been able to obtain other unreleased games by contacting their developers, Bio Force Ape's creators remained anonymous and silent. In 2005, a thread titled "Bio Force Ape" was created at Digital Press, a popular forum among video game collectors. Offering scant few details, "Paul Brown" posted evidence of his discovery. 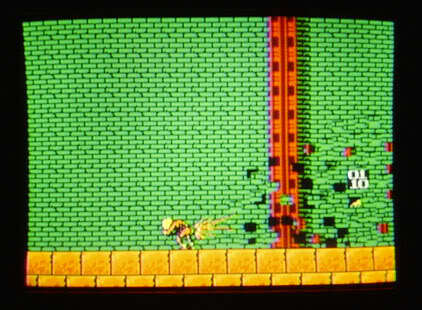 Images of a prototype cartridge surfaced, along with photographs of the game in action. Brown's gameplay descriptions matched Nintendo Power's previews. 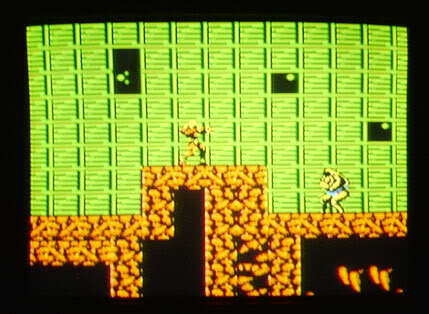 His screenshots showed a side-scrolling platformer in an early state of development, but with many gameplay features fully implemented. As Brown's posts continued, forum members were treated to odd cutscenes, questionable enemy designs, and...this. Soon, an argument erupted. Collectors urged Brown to sell the prototype. Preservation-minded replies asked Brown to consider the possibility of dumping the game and distributing a playable ROM image. 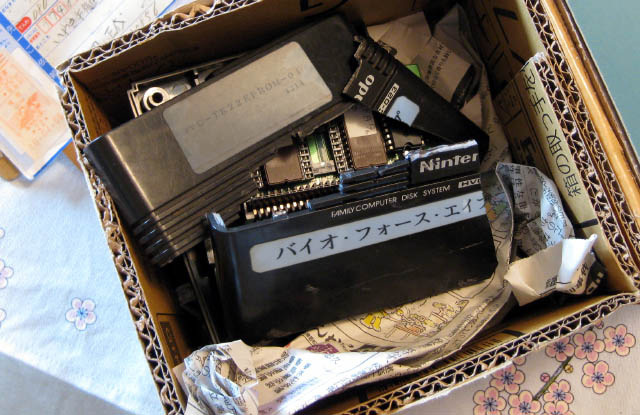 The collectors warned that dumping the game would reduce its market value, while an undumped cartridge could fetch $2,000 or more from a willing buyer. Pages of angry diatribes followed. A befuddled Brown continued to post screenshots. 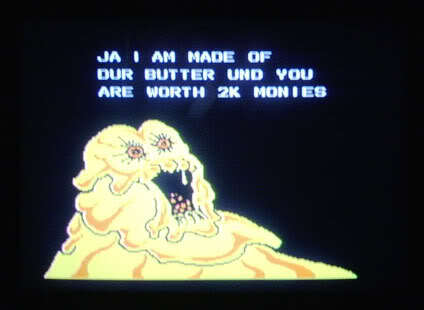 One of the game's later cutscenes proved surprisingly relevant to the conversation. Somehow, the arguments at Digital Press continued without a hiccup. 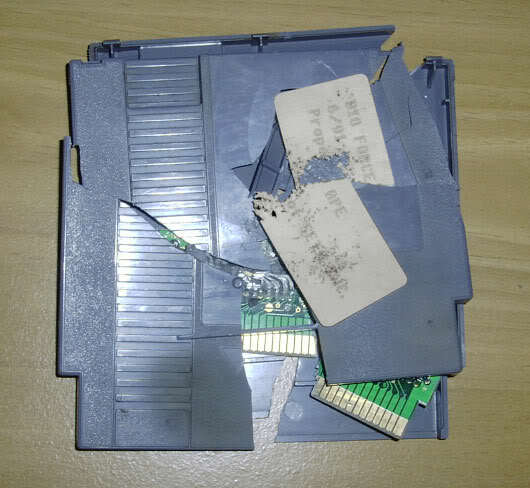 Frustrated at his inability to generate meaningful discussion and concerned that his discovery had upset the Digital Press community, Brown made one final reply, showing the Bio Force Ape cartridge smashed into pieces. Neither collector nor preservationist would enjoy its buttery secrets. The prank gave Bio Force Ape newfound popularity, and it gained notoriety that far exceeded the close-knit collector's community. A minor meme was created, and another Internet legend was born. In the years that followed, though, Bio Force Ape again faded into obscurity. In March of 2010, a prototype version of Bio Force Ape surfaced in a Yahoo! Japan auction. 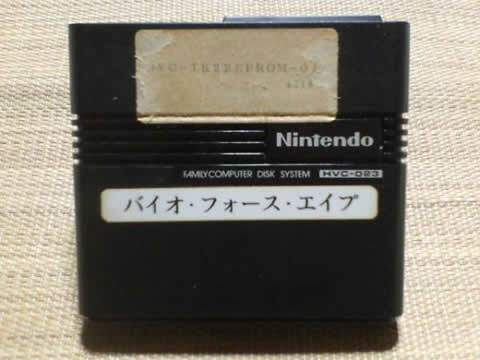 A single screenshot and a picture of the cartridge were posted, along with a very short description. The seller was seemingly unaware of the treasure he possessed (though he priced it high, just in case!). Notified by "Paul Brown" himself (who had in the years since revealed himself to be Digital Press forum regular Bratwurst), Lost Levels founder Frank Cifaldi organized an emergency meeting of site staff. Little had to be said about what was at stake. Gathering donations from friends and forum members, Cifaldi placed a bid. The auction ended at 250,000 yen, or about $2,700 -- slightly more than the 2K monies prophesied years before. There was still a fair amount of uncertainty that loomed large, however. What if the auction was fake? What if the cartridge was dead on arrival? What if the game was bitrotted, incomplete, or unplayable? It was a lot of money to risk on a legendary piece of gaming history that had only been rumored, parodied, and pranked in the past. Moreover, the auction ended on April 2nd, 2010, leading some to believe that it was simply an April Fool's joke. When the cartridge arrived, would-be dumper Chris Covell produced a devastating photograph. In the fine tradition of Bio Force Ape, however, the picture turned out to be a hoax. The game arrived at its destination intact, and was dumped immediately. Bio Force Ape was saved. Playing the game for the first time, something unexpected becomes apparent; not only is Bio Force Ape playable from beginning to end, but the game is somehow even weirder than what Nintendo Power, Internet rumors, and Paul Brown's hoax had suggested. But I'll let Frank talk about the game itself. Below is a complete annotated playthrough of Bio Force Ape. It was a long road to where we are today. 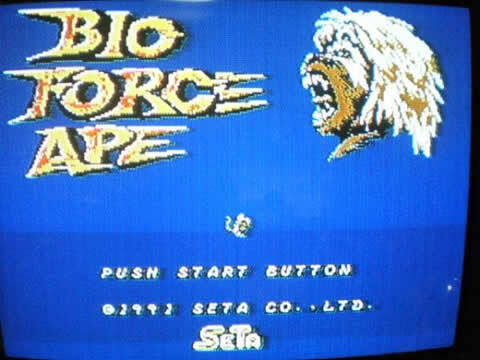 Bio Force Ape gave up the fight only after many other high-profile unreleased games had been discovered and released as playable ROM images. It feels like the end of an era. Where do we go from here? What could possibly top Bio Force Ape? At the same time, however, Bio Force Ape's discovery is invigorating. If something so bizarre -- with far more rumors to its name than confirmed facts -- could be successfully recovered from obscurity, surely anything else could also be saved. Suddenly, unattainable titles like Bandai's ready-for-retail Ultimate Journey, Nintendo's scrapped NES port of SimCity, and the mysterious Yeah Yeah Beebiss I seem closer than ever before. 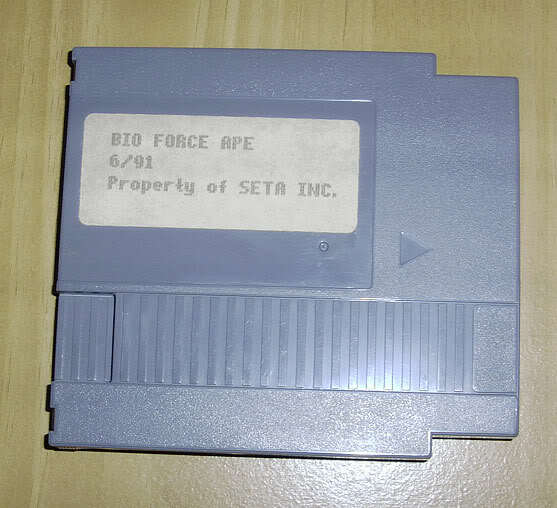 A playable copy of Bio Force Ape exists. It's preserved, forever. I can't wait to see what's next. Download Bio Force Ape here.